A monument honoring native American legend Crazy Horse is slowly taking shape high above the Black Hills of South Dakota. For nearly 70 years, crews have been blasting millions of tons of rock off the mountain. Sculptor Korczak Ziolkowski began construction in 1948. His work on Mount Rushmore drew the attention of Lakota Chief Henry Standing Bear who invited him to design a memorial to American Indians. His daughter Monique now oversees the work. 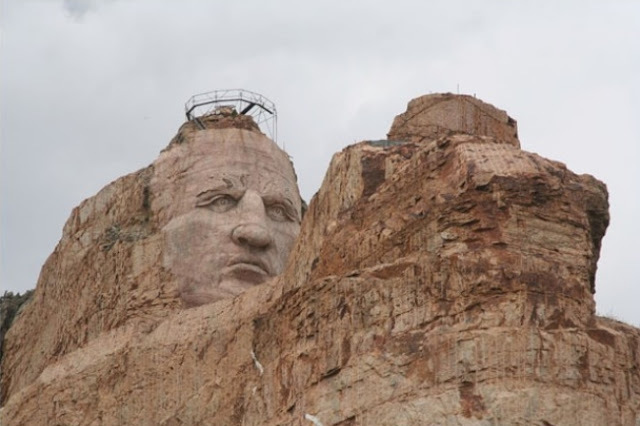 Crazy Horse’s face was completed in the late 90s. Crews are now working to shape the horse’s head and Crazy Horse’s outstretched hand. In some spots, the crews only have a few feet of rock left to remove, but finishing just the hand will take years. Caleb Ziolkowski is the third generation of his family to work on the project. “It is hard from a mile away to see the changes,” he said. “Since the time that I started this hand area has changed immensely.” Native Americans say whenever it’s done it will provide a valuable education and ensure Crazy Horse’s place in history. The work is privately funded through admission fees and donations. In addition to a museum, the master plan for the site includes an Indian University of North America. Responses to "Monument Of Native American Hero ‘Crazy Horse’ Slowly Takes Shape In South Dakota"
I've seen both Mt Rushmore and Crazy Horse. Even though Crazy Horse wasn't anywhere near finished, I appreciated it much more, especially when thinking about all of the sacred lands that were destroyed in the carving and creating of Mt Rushmore. This is a True gift to the World.. This is wonderful! My only wish is that the American Indians could be part of the design and building of Crazyhorse. We were here on Tuesday, our second visit. Just a fantastic place to learn about Native American history. The passion runs deep at this memorial - from the museum to the artists studio to the monument itself. Amazing. Where is this in S. Dakota? Planning to visit this part of the country soon and would love to see it. I want to follow this! The video works just great in Finland. I first saw this around 1963 and hoped it would done by now. I think crowd-sourcing should begin to help raise funds. What about some of the celebs like Kostner? Dear uploader of the video, contrary to various internet myths, Australia does exist. May we see the video too? Crazy Horse allowed no photographs or drawings. This was deliberate. KNOWING that the Lakota people had heroes is not the same as destroying a mountain. I wonder if Standing Bear really "invited" him to do this. Something Aboriginal people can be proud of! Atago! The pose, and the message it is intended to carry, stem from taunting Crazy Horse received while he was a captive of the United States. Someone mockingly asked him: "Where are your lands now?" He is said to have stretched out his hand and replied: "my lands are where my people lie buried". The face is intended to be symbolic since no one knows what Crazy Horse looked like (I do recall once reading that Korczak was more looking forward to carving the horse). But the pose and the gesture are the main thing. The Visitor Center there puts Mt. Rushmore to shame! My father served in the same unit as Korczak in WWII and they kept in touch after, my dad sent Korczaks family cookies every Christmas I remember,and we visited in the 60's. Living in Chicago area we learned about Native American history from this and not from textbooks. Ive never been back so its nice to see the video, thank you White Wolf for posting. Ok, time for the truth, this family has taken most of the money they collect every year to build their own empire. If they would have put it into the moutain it would have been built decades ago. See with the we only take your cash to build it we can keep the tourist cash coming in forever thats why it'll never be completely done. Check the records, their the biggest land owners in Jackson hole WY. Thats where all the cash go's. Remember, Korczak tired to get Fools Crows endorsment so he paid him to do a ceremony at his place hopping it would get him on board, he gave him a star quilt befor he started, hopping to buy him. During the ceremony Crazy Horse's spirit came and called Korczak the enemy and counted coup on him,Lol. Korczak became so mad he thru fools Crow and his helpers out. Korczak had a 400 lb stone chair he carved in the room they were in and he followed Frank outside to demand the quilt back and Frank told him the quilt was under the chair, the spirits put it there in the dark befor Korczak lost his cool. These people are expolters profting off of our culture and Crazy Horse, and what do they give back? They let Indians in for free, so the turist can say they saw real injuns in there, like we support them whem. Crazy Horse would never want one of our sacred sites desecrated with his or any other image. He was way to humble to allow such a thing. Ha Ho! I agree with Beau Bordeaux... I have been there 3 times in the last 15 years and have not saw much progress in stone. I agree it should have had a lot more progress by now. The exhibits are great because they show the real Natives because a lot of the exhibits were donated by Native tribes. As a Native I do have free access but the feeling I get there is not a good one... I can see and feel its just another white owned tourist trap. I probably will visit again when I am in the area only to see the Native exhibits as its one of the few places you can see the history in quantity. I made a similar comment a few years ago and this story reinforces my feelings. Red Horse, long live your spirit and the spirit of all the 8 million genocided Indians slaughtered by the hand of white man. I wish men would stop defacing Nature in order to aggrandise males! It’s disgustingly atrocious! I value native people’s and seriously doubt any in their right mind would support any such disfigurement! This clearly not Crazy Horse. It's George Washington, an Edomite. Crazy Horse was a man of complexion. Quite a project to undertake! Much cynicism in the comments... but I think this is more of a tribute to the Native American culture than casinos on native reservations! I'd like to know which of the nay saying commentators put 3 generations of their family working on something better to honor the Native Americans? I am 54. I got to see it in the mid 70s. I can only wish I could see it finished. It is a magnificent statue dedicated to a strong leader. This is awesome. I wish my mother was alive to see this. We saw this in Sept. 2018. Amazing. Taking a while to tackle this. Really is a great tribute. I still can't get over THE TRAIL OF TEARS.HOW UnGODLY. Beau Bordeaux is probably the closest to the truth about this "monument" I remember back in '64 reading how Korczak got fired off the Rushmore crew. 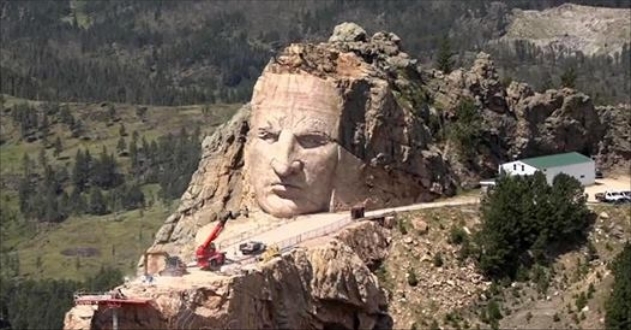 Also when they did research on building Rushmore that "rock" where they are supposedly building Crazy Horse was avoided because it has too many soft spots so this fact alone will tell you it'll never be finished and I remembered the locals figured it was just a money scheme this guy cooked up. Him and his family has lived off the naive people that want to believe in something. So sad. I was here 30-something years ago and absolutely no noticeable work has been done since. This "monument" looks EXACTLY the same as it did when I saw it in person. I suspect that it will NEVER be completed. In 1939, a monument similar to Mount Rushmore was requested to immortalize on sacred ground the Oglala Lakota war hero Crazy Horse, and to celebrate the Indian Nation. In 1948, a small group of craftsmen took over the monumental task of sculpting the mountain into a man. This video documents the devotion they have to the pursuit of perfection. It’s the story of five men against the mountain who know the sculpture won’t be completed in their lifetime. But like all well-crafted monuments, it will not only live on as a tribute to Crazy Horse, but also as a tribute to the craftsmanship and perseverance of those who built it. Work began on the Crazy Horse Memorial in South Dakota in 1948. Those working on it now say they'll be gone before it's finished. This one is perhaps the best of the bunch for showing how extensive the work is & will continue to be. There's lots more videos on YouTube. Just search for "Crazy Horse Memorial" and you'll get lots. We live just minutes away from this "monument ". It is nothing more than a cash cow for the family. Once the father died the family did not have the passion for the sculpture. They spend much time over seas on "fund raising" trips. The fees collected at the entrance are in the millions each year. They have the money to complete it, but they would rather spend it on their life style.